Your choice to add a Golden Retriever puppy to your family is a great one. This is one breed of dog not only devoted reliable, but also good with children. 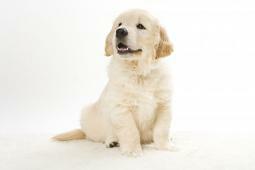 Golden Retrievers have high levels of energy and therefore need vigorous daily exercise, especially as a puppy. You will find it best to begin training golden retriever puppies right from the start. The first part of golden retriever puppy training should consist of daily routines. Golden Retrievers thrive on routine as it a comfort to them. This includes teaching your puppy where his food and water is, and when he eats: usually morning, early afternoon and evening. You can also check out our complete golden retriever dog training system. He needs to know where he sleeps and when. It is not recommended you allow your puppy to sleep on your sofa or bed as it could quickly become routine for them, and you may not want to have your full-grown Golden Retriever sleeping in bed with you or shedding on the sofa. This is an ideal time for you to be training Golden Retriever puppies the rules of your home. The earlier you teach them the less trouble you will have enforcing the rules as your puppy grows. From correction to praise, crate training to housebreaking now is the time to get started. Golden Retrievers are very intelligent dogs with a willingness to please their master. By using the following methods you will find them to be respectful and obedient additions to your family. Before you begin puppy training your Golden Retriever puppies, it is important that you have an understanding of the method you intend to use. Make your commands clear when dealing with your puppy. 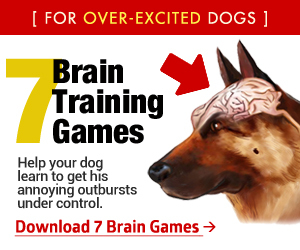 The clearer your commands, the more obedient your dog will become. If your commands are not clear, you will not have the desired results with your Golden Retriever puppy. 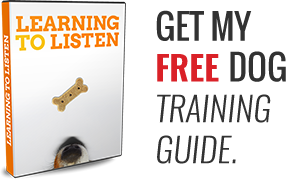 Many successful trainers rely on a positive reinforcement and clicker training system. 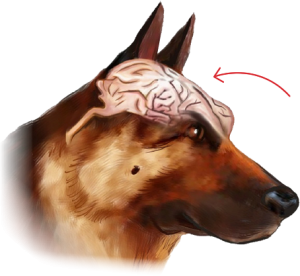 Clicker training leans heavily on positive reinforcement to help ensure the dog repeats the same action or behavior in the future. The clicker itself is a small handheld device used by professional trainers to signal when a behavior has been performed correctly. The point is to get your Golden Retriever to accomplish the requested task and relate good work to the sound of the click. When the click is received, you can now follow up with your predetermined reinforcement, usually a treat or reward. When it comes to Golden Retriever house training or potty training it is best to pay attention to body language as much as eating times. If you see your puppy circling or sniffing the floor, it is usually a sign that it’s time to go outside. This occurs between 20 and 30 minutes after a feeding. When your puppy eliminates in the designated location, it’s time for a click and reward. It’s as easy as that! The positive reinforcement of praise and click will be enough for your Golden Retriever puppy to continue this action. 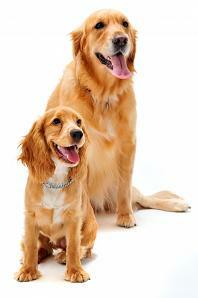 Golden Retriever crate training or cage training is another method to house train your puppy. The size of the crate should only be large enough for them to be able to turn around and lie down. If you don’t want to purchase multiple crates as your Golden Retriever puppy grows, you can buy a large crate but create a barrier with a piece of heavy cardboard or sanded plywood so the accessible area they have is just large enough for them to be comfortable. As your puppy grows, you continue to move the barrier until they are using the full crate or cage. Normally dogs won’t relieve themselves where they sleep. Your Golden Retriever will soon see its crate as a safe and secure place to be, especially when you are away from home during the day to work. Basic Golden Retriever house training rules require you to never use crate or cage as an area for punishment. This will defeats the purpose of providing a safe and comfortable place them. They need to know from first introduction to the crate or cage it’s their space to rest, sleep or get away from uncomfortable situations. Introduction should be done gradually, limited to required time only. Once your puppy becomes accustomed to this concept, he will go into his crate all on his own to rest or retreat. If you opt for a cage instead of a crate consider covering the top with a blanket or towels to provide a reassuring “den” type location for him. Golden Retriever crate training requires you to take him outside immediately upon letting him out of his crate. Teach him that when you open the door with leash in hand, it’s time to go outside. It is not recommended to open the door until you are ready to bring him outside, as it will give him time to roam the house and therefore giving him many different locations to eliminate instead of outside. By following this method your Golden Retriever puppy will learn to wait for you to go outside. How A Tennis Ball Could Cost You Hundreds if Not Thousands of Dollars…. Which Are The Best Dogs For Kids; and Which Breeds Aren’t?